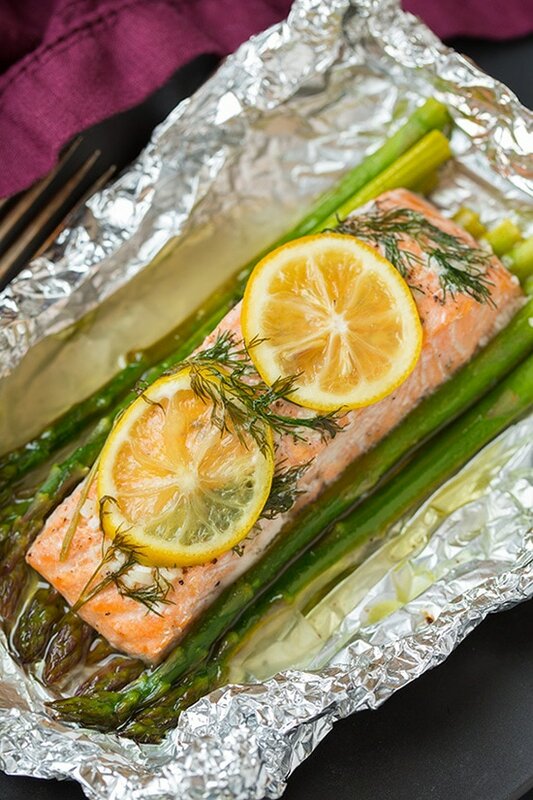 Baked Salmon and Asparagus in Foil couldn’t be easier to make and results in juicy, succulent baked salmon and perfectly cooked asparagus. Serve this salmon with salad or mashed potatoes for a complete meal, perfect for busy weeknights! A Must Have Baked Salmon Recipe! 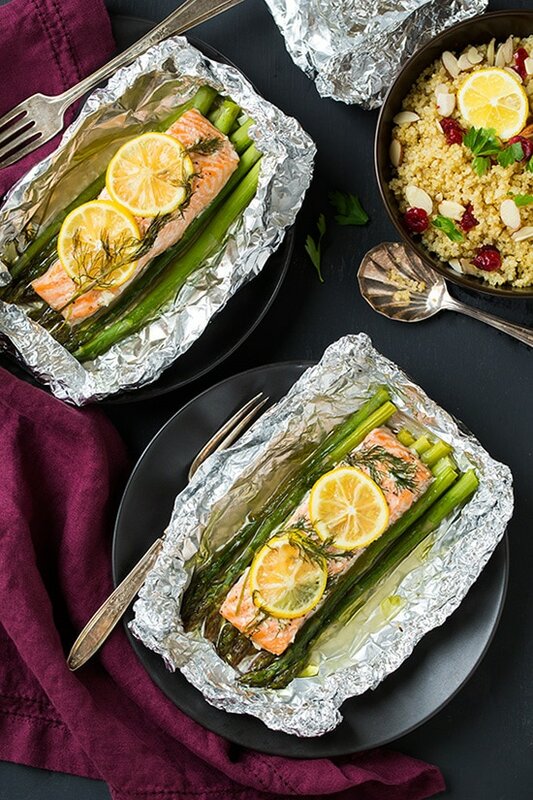 This salmon really couldn’t get any easier and the method of cooking it all together in a foil pouch seals in moisture and keeps the flavors intact. It’s also a very versatile recipe, you can use other veggies that need using up. 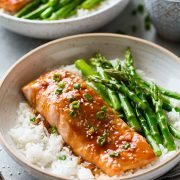 I love how fool proof this recipe is, even if you have minimal experience in the kitchen you can easily make this salmon! Once you try this you’ll likely turn to this method time and time…and time again. I know I will. Salmon is one of my favorite dinners and this is one of my favorite ways to prepare it. Cut the salmon into equal portions. 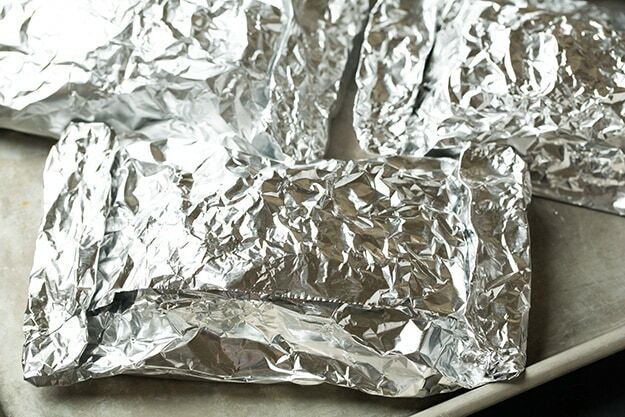 Cut the foil into 4 equal sheets and divide the asparagus spears into equal portions, laying them in the centre of the foil. 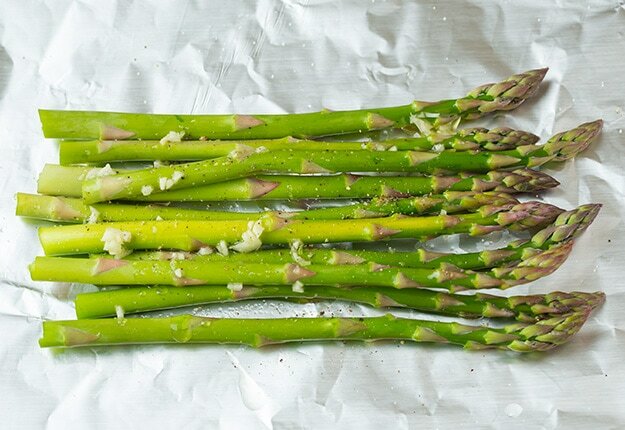 Mix together minced garlic and oil and drizzle over the asparagus. 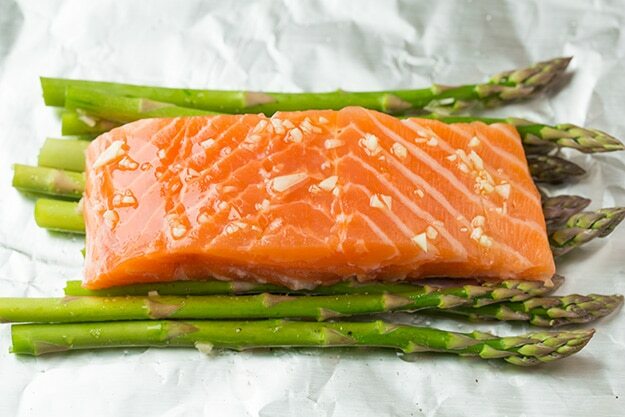 Season each salmon fillet and lay over the asparagus. 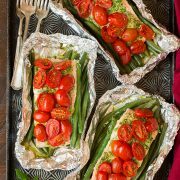 This salmon recipe will take about 25 minutes at 400 degrees to bake because it’s wrapped in foil with other ingredients. Generally though individual salmon fillets in a baking dish will take about 10 – 14 minutes at 400 degrees. 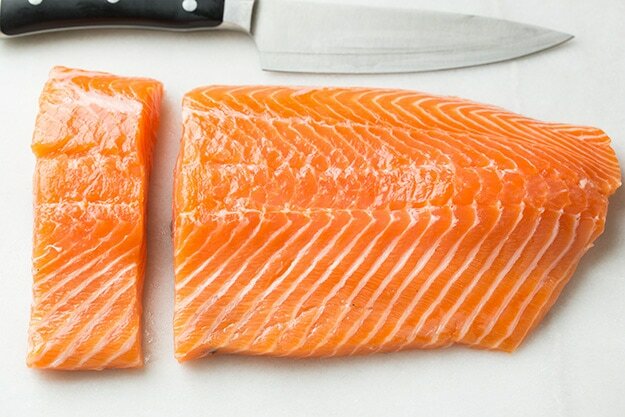 A side of salmon will take about 15 – 20 minutes at 400 degrees. 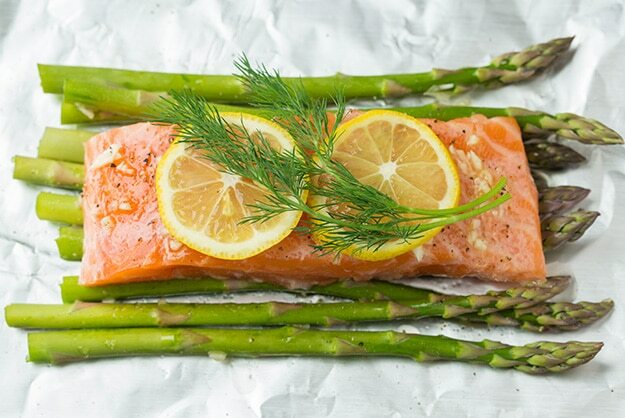 Other Salmon Recipes You’ll Love! 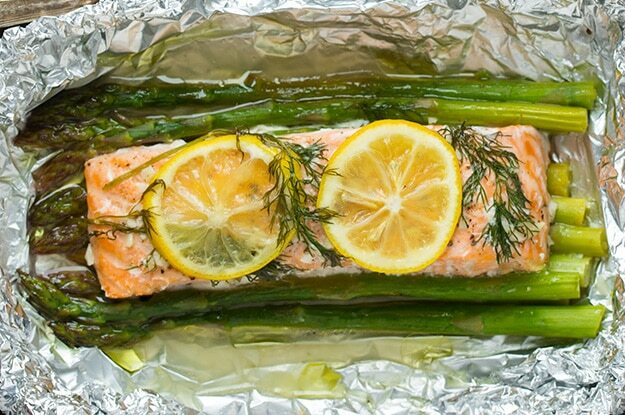 This salmon and asparagus in foil couldn't be easier to make and results in juicy, succulent baked salmon and perfectly cooked asparagus. 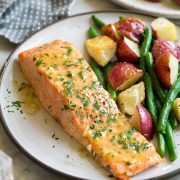 Serve this salmon with salad or mashed potatoes for a complete meal, perfect for busy weeknights! I have made different food from your site and so far have had great success with them all. I was wondering if I didn’t have fresh dill on hand, could I use dried?, I understand that fresh herbs are so yummy when adding to foods, but I was curious and wanted a plan B, just incase. How much dried dill would I use in place of the fresh?. Thank you for your time and patience. Like many I use to just cook from a box, lol…but I discovered online recipes gave it a wack, and discovered I loved making food! :-), thank you for your yummy ideas.